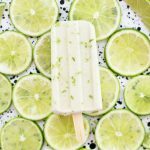 Lime in the Coconut Popsicles – These creamy coconut lime popsicles are such a tasty paleo or vegan treat! Just 3 ingredients and naturally sweetened, these are creamy, dreamy & delicious. Yum! You’re welcome/I’m sorry for getting that song in your head. 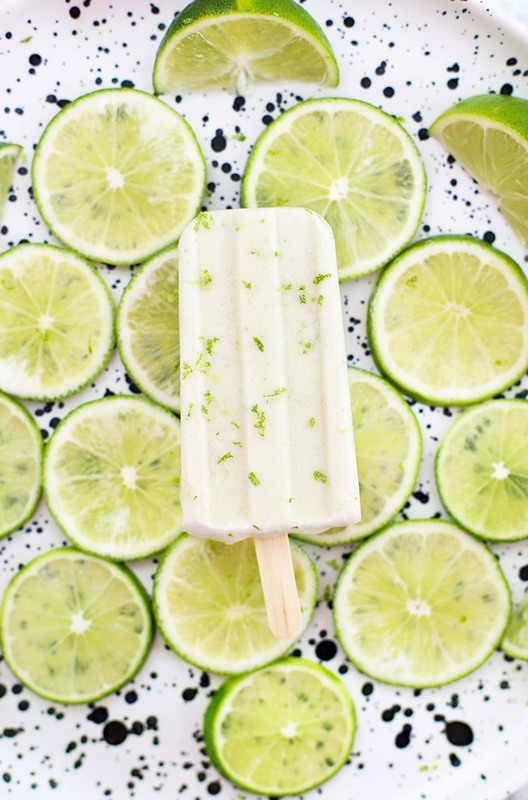 What else could one possibly name a coconut lime popsicle? I practically had no choice. Still friends? Lovely. An interesting part of working on trying new foods with two tiny people with NOT-tiny opinions is seeing what goes over well and what doesn’t. Milo, for instance, hates most carb-y things. I don’t understand this at all. He doesn’t like pasta, potatoes, or rice. Sophie, on the other hand, LOVES carbs and struggles more with protein or fat-containing foods. It makes meals and snacks pretty tricky sometimes! 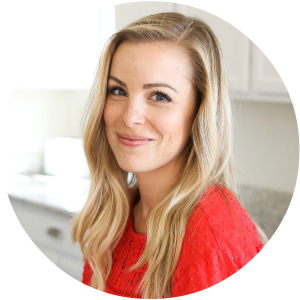 We stick to a basic formula at meal times (try to have at least one thing each child likes on the table so no one goes completely hungry), and then gently encourage them to try new foods. It’s rare that something is just flat out successful with both children on the first try at dinnertime, but I’ve found that snack time can be a great opportunity to set them up for success. Especially if that snack is a homemade coconut lime popsicle! Smoothies, banana ice creams, and popsicles almost always go over well at our house. It’s a great chance to get in some extra fruits or veggies, or some healthy fats or protein. Whatever it is we need! 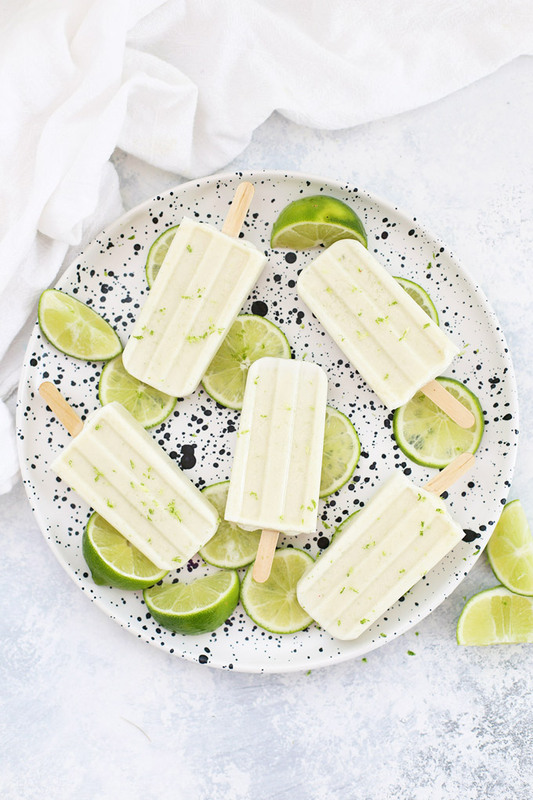 These coconut lime popsicles are creamy, dreamy, and delicious. We use full-fat coconut milk (yay healthy fats! 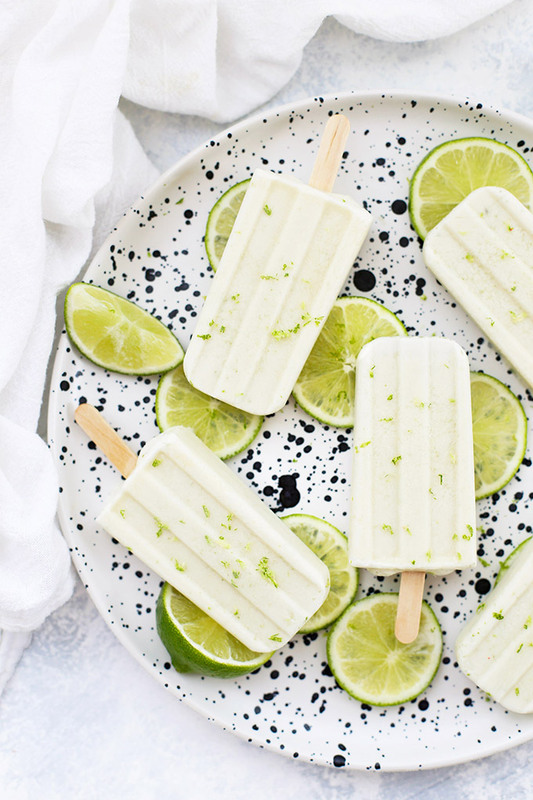 ), lime juice, and honey or agave to make these awesome popsicles. The flavor develops as they freeze, so if you taste the smoothie mixture and it seems a bit flat, just wait. The lime will diffuse throughout the coconut milk and the end result is delicious. Not overly sweet, but really delicious and creamy just the same. I love the texture of these. They feel so dreamy and decadent! They’re one of my favorite ways to cool off on a hot day, and they’re a snack I can feel good about any time. Any popsicle mold will work for this recipe, but this popsicle mold is the one I use and recommend most. It has a lid that holds the popsicle sticks in place, and that’s been really handy for us. If you don’t have a popsicle mold, you can pour the mixture into paper cups, freeze for 30-45 minutes, then poke the popsicle sticks into each cup and continue freezing till solid. You can control the amount of lime that goes into the recipe. These are a nice blend of coconut and lime flavors. If you want yours more lime-y, you can add the juice of 2 limes instead of 1 (about 3-4 Tbsp vs 1-2 Tbsp). Also, note that sometimes the lime zest will settle at the bottom of the popsicle mold if you haven’t blended it much, which means the first bite of popsicle might be a bit lime zest-heavy. This hasn’t bothered me or my kids, but I’ve found that a cycle through the blender does the job for us. Protein boost? If you like, you add 1 scoop collagen protein to these (for paleo, not vegan) along with the other ingredients in the blender. It’ll blend right in! Getting them out of the mold. If you’re new to making your own popsicles, you’ll want to run the outside of the popsicle mold under water for a few seconds to loosen the popsicle from the mold. Then, using a side-to-side motion, you’ll be able to pull it right out. Be sure you’ve frozen them at least 3 hours so they’re solid first! To make these look extra pretty, add a little fresh lime zest to the outside right before serving (like I did in the photos). Combine all ingredients in a blender and process until completely smooth. This won’t seem to take long, but the longer you process, the finer the zest will become and the less likely you’ll be to end up with all the zest sinking to the bottom of the popsicle mold. Freeze at least 3 hours or until completely solid. You can control the amount of lime that goes into the recipe. If you want these extra lime-y, you can add the juice of 2 limes instead of just 1. It’ll come through a bit more! These popsicles look incredibly delicious! I’m definitely going to be making them this summer! These sound wonderfully refreshing! And simple! Thank you for sharing. Yum! These look and sound perfectly paleo! Glad to have found your site and can’t wait to try this recipe (and snoop around for others) 🙂 I have a feeling both girls will love this! Just fyi, I tried to access this recipe from my phone and this scam website pops up claiming to give me a $1000 Walmart gift card without a way to get out of it. I closed and opened a new browser 5 different times just trying to get this recipe but the scam pops up EVERY time. Finally, I tried on my husbands phone and it worked. I’ve never had this happen on any other website. Just wanted to make you aware you may have some followers having a hard time getting here due to the pop up ads… Btw thanks for the recipe. Looks awesome. Colette – Yikes! That’s no good! I’ll have my host look into it. Please let me know if that happens to you again! 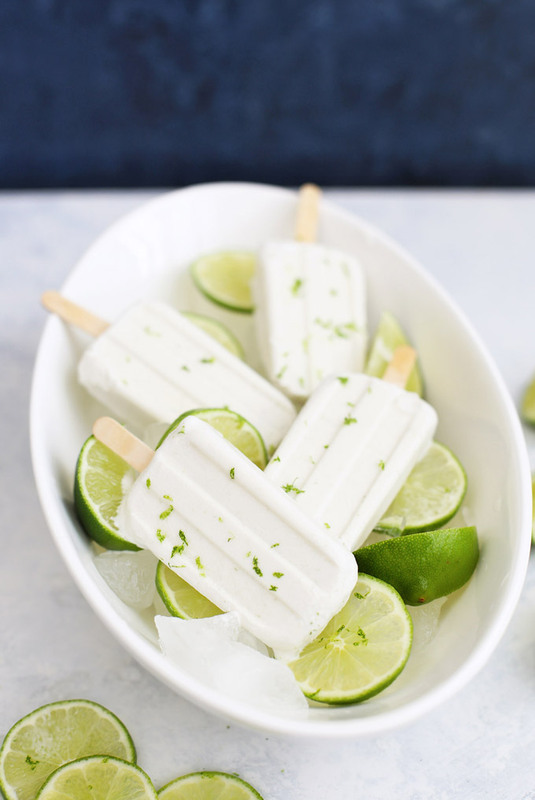 My kids asked for coconut lime popsicles, so I tried these out because they looked yummy and simple. I tried it with two different coconut milk brands, and it curdled both times! What am I doing wrong? Gururas – Oh, no! I haven’t ever had mine curdle before! Blending them in the ingredients in the blender has solved that problem for me. I’ll think about it and see if I can come up with a solution for you. Again, I’m so sorry! Do you use unsweetened coconut milk? I do. Unsweetened full fat canned coconut milk (not lite). Hope that helps! I’m sorry but these turned out awful. Terrible tasting, and mine also curdled. They were not creamy and just had a bad texture. How strange! I’d love to know more—what kind of coconut milk did you use? Did you blend them with a blender for at least 30-60seconds? That’s never happened to me! Jennifer – maybe did you use coconut beverage instead of the thicker coconut milk that comes in a can? I’m sure you could! Just add a tablespoon at a time until they taste the way you want them to! I just made these over the weekend. The taste was delicious but the coconut milk and lime juice separated. Any ideas how to avoid that? Susan – I’m so glad you loved the flavor! Did you use canned coconut milk? I’ve found if I don’t run the blender for the full cycle (about 1 full minute) that sometimes you can run into separation issues. Yes, I did use canned coconut milk. Perhaps I didn’t run the blender long enough. Hmm… if you try them again, I’d recommend letting it go a bit longer. I’m sorry you had that issue the first time! Made these tonight and I’m obsessed! So easy and SO good! YAY! I’m so glad you loved them! I appreciate the recipe and really wanted to like these a bit more. I did use full fat canned coconut milk (not the beverage), zest of 1 lime, juice of 1 lime, and agave. Mine did not separate like others had mentioned, but I did find the lime overpowering. I would suggest starting with half the zest and the juice and adjust to taste, because mine just tasted like lime pops and I didn’t get any creamy coconuttiness that I was hoping for. I’m sorry to hear that Nicole. Sounds like you’ve got a great plan for next time!